Federal Ammunition was recently awarded a significant contract from U.S. Naval Surface Warfare Center, Crane Division (NSWC), for MK 318 Mod 0 carbine small rifle cartridges. The five (5) year Indefinite Delivery Indefinite Quantity (IDIQ) contract, is valued at $41 million, and will begin shipping early in 2019, to be utilized by Navy and Marine Corps units. The MK 318 Mod 0 cartridge, Caliber 5.56mm Ball, Carbine, Barrier is compatible with existing 5.56mm weapons systems and utilizes Federal’s unique barrier defeating projectile. The 62 grain open tip match, lead free projectile is designed to defeat intermediate barriers while providing terminal performance through barriers commonly encountered during warfare, like auto windshields and doors. Headquartered in Anoka, Minnesota, Federal ammunition has been providing shooters with high-quality rimfire, centerfire and shotshell ammunition since 1922. It pioneered the Premium category of ammunition and is a world-leading ammunition manufacturer. The NSWC cohesively and seamlessly operates the Navy’s full spectrum research, development, test and evaluation, engineering, and fleet support centers for offensive and defensive systems associated with surface warfare and related areas of joint, homeland and national defense systems from the sea. Federal Ammunition – is a brand of Vista Outdoor Inc., an outdoor sports and recreation company. For more information on Federal ammunition, go to federalpremium.com. Barnaul brand ammunition is finally available in the U.S.
MKS Supply is the first U.S. company to start working with Barnaul to import/market and sell a wide selection of Barnaul branded ammunition in the U.S.
Barnaul has produced high quality ammunition for more than 70 years. It has been used all over the world, and the company currently produces a variety of privately labeled ammunition sold in the US market by multiple US companies. Barnaul is one of the few privately owned Russian ammunition companies approved to supply ammunition to the Russian Army. Its high standards and extreme quality control measures have also earned Barnaul the privilege of supplying the Russian Special Forces with its superior ammunition. 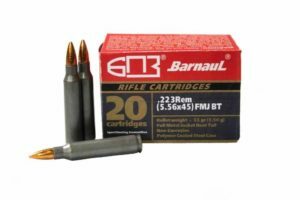 The Barnaul brand is new to the U.S. market, but it is known worldwide for providing premium ammunition at an affordable price. Barnaul uses steel casings and evolutionary machining techniques to produce economical ammunition in both polymer and lacquered finishes, while not compromising quality. MKS Supply (exclusive marketer for both Hi-Point Firearms and Inland Manufacturing) will initially import the following Barnaul ammunition: 7.62×39, .223 (5.56×45 NATO inclusive), 6.5 Grendel, 5.45x 39, .308 (7.62×51 NATO), 7.62×54 rimmed, .30-06 Springfield, .45 ACP, and 9mm Browning/Luger/Makarov. Many of the listed calibers will also offer various bullet weights and bullet configurations, including FMJ, SP, HP, FMJBT, HPBT, and SPBT. Barnaul branded ammunition will be available through retailers nationally beginning the first of December. Drop by the MKS Supply booth 16144 at the 2019 SHOT Show to check out this ammunition, Hi-Point Firearms and Inland Manufacturing. Steel shellcase ammunition has been a favorite among value-minded shooters looking to reduce the expense of shooting, while at the same time increasing their opportunities to shoot. 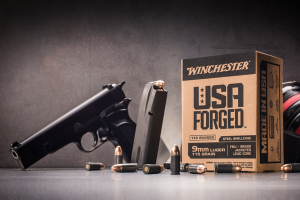 In the new USA Forged, Winchester introduces a steel shellcase product that is made in the USA. USA Forged represents the culmination of an extensive development project that resulted in new manufacturing methods. This new line is proudly manufactured in Winchester’s Oxford, Miss., manufacturing facility and utilizes precision-made steel shellcases with a proprietary coating for improved reliability and corrosion resistance. The noncorrosive boxer primers and clean-burning powder are ideal for high-volume range sessions, while the brass jacketed (nonplated) lead-core bullets can be used on any range and can also be used in any pistol type; including ported, vented or suppressed pistols. USA Forged will be offered in a 150-round box of 9mm cartridges with 115-grain full metal jacket (FMJ) bullets that feature a high-quality brass bullet jacket. The rounds, which boast a muzzle velocity of 1,190 fps were extensively tested during development for functionality and reliability. Shooters should expect great on-the-range performance with this new product. Reader Poll: Best Caliber for CCW? It is a never ending debate – which caliber is best for a carry gun? One caliber may penetrate while another might not. One caliber allows for carrying more rounds while another may make a bigger hole. One might be available off the shelf while another is difficult to find. There is a lot of information out there such as FBI terminal ballistics tests and reports on handgun wounding factors and effectiveness that present empirical data on various rounds. Perhaps you have done your own testing or know someone who has. Maybe you just picked it because there were zombies on the box. No matter how you picked it, we want to know which caliber you use for your carry gun. Choose your answer below and feel free to expand on your answer in the comments section with what type of ammo you use in the caliber. 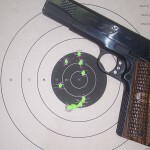 What do you think is the best round for CCW?